The theme for the November Julep Maven box is Right at Home, and the colors do make me feel like curling up next to a fire. Perfect fall and winter tones for the cold days coming! One of the polishes has a satin finish, the navy on the right. 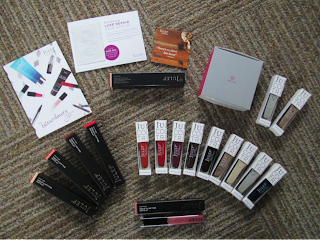 This is the full upgrade for November: 9 polishes, 5 lip glosses, and the Blank Canvas Lip Primer. It was $74.99. Monthly Julep Maven boxes usually cost $19.99 and come with either two products (a gloss and the primer this month), one product and two polishes, or three polishes, depending on your style profile. This month there were two upgrade options. For an additional $35, you could get all 9 polishes plus 1 gloss and the primer, or for an additional $55, you’d get everything in the first upgrade plus the rest of the glosses. 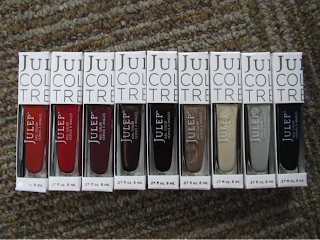 One thing I love about Julep is that during the box selection window, they show swatches of nail colors and products on different skin tones. That’s particularly great with a product like a lip gloss, since I tend to swatch them on the back of my hand in stores. 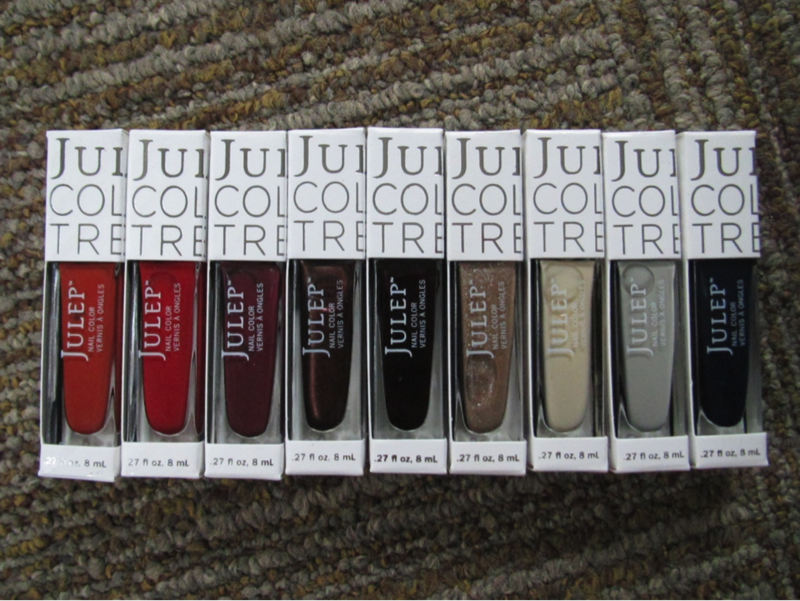 You can see the official Julep swatches and what colors came in each profile here: http://www.julep.com/november-right-at-home-collection. You can try your first Julep Maven box for free by taking the style quiz and entering code FREEBOX at checkout. You do pay $3.95 shipping, but after that, Mavens get free sitewide shipping! Julep also has a friends and family code right now for 50% off most items on their site – GOCRAZY.